Searching for a Valentine’s restaurant in London, guaranteed to take your (and your partner’s) breath away? As anyone who has tried to book a Valentine’s date near the big day will attest, it’s best to get these things sorted pretty far in advance. 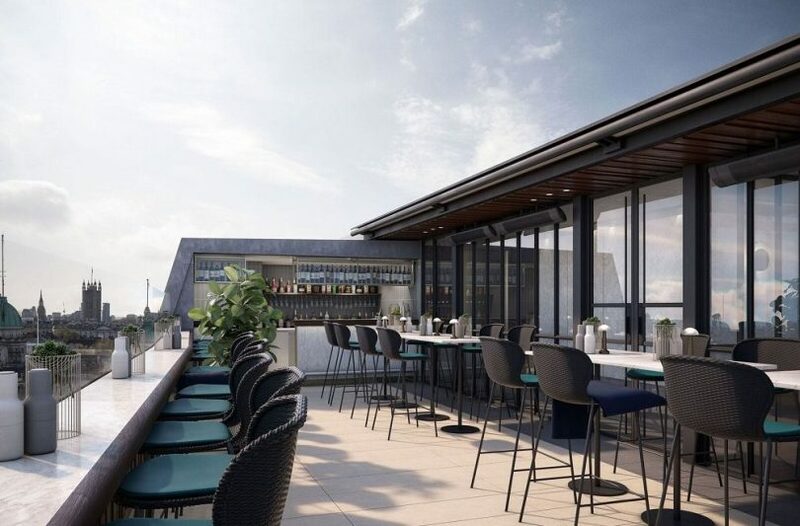 Restaurants tend to get fully booked fairly quickly… and if you’re looking for a table at one of London’s stunning rooftop bars, you’d better start making your reservations soon! Just imagine; it’s the most romantic night of the year, and you’re sitting high above the city, watching the sun set over one of the most iconic skylines on earth. The glow of the fading sun is sparkling off the water of the Thames, the glittering lights of London start blinking to life as darkness falls, and you and your date for the night settle down to tuck into some seriously good food and drink. If that doesn’t sound like the ultimate loved-up fantasy, then we don’t know what would! However, finding the perfect Valentine’s restaurant in London isn’t a task that should be taken lightly. Whether it’s a first date or a fiftieth anniversary dinner, plenty rests on the choices you make… and who knows? Picking the best Valentine’s venue in London may have the power to seal the deal on your romantic intentions. 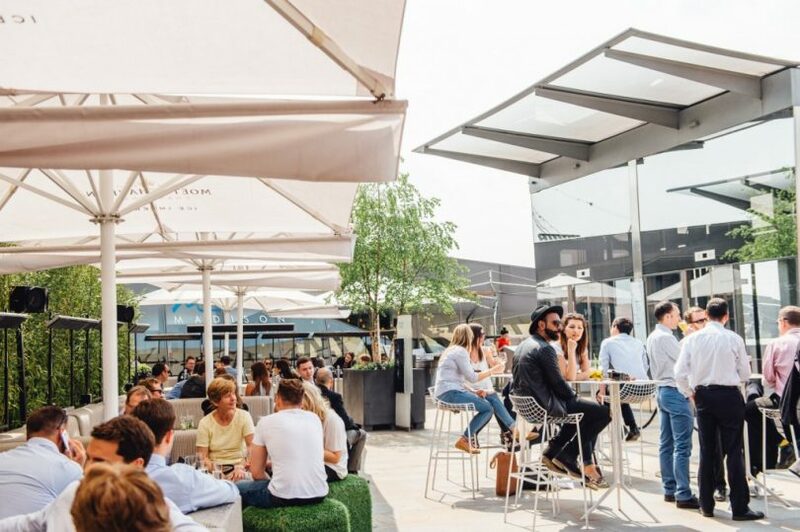 It’s certainly a grand gesture which won’t go unnoticed, and rooftop bars in a city as beautiful as ours have the potential to seriously impress. 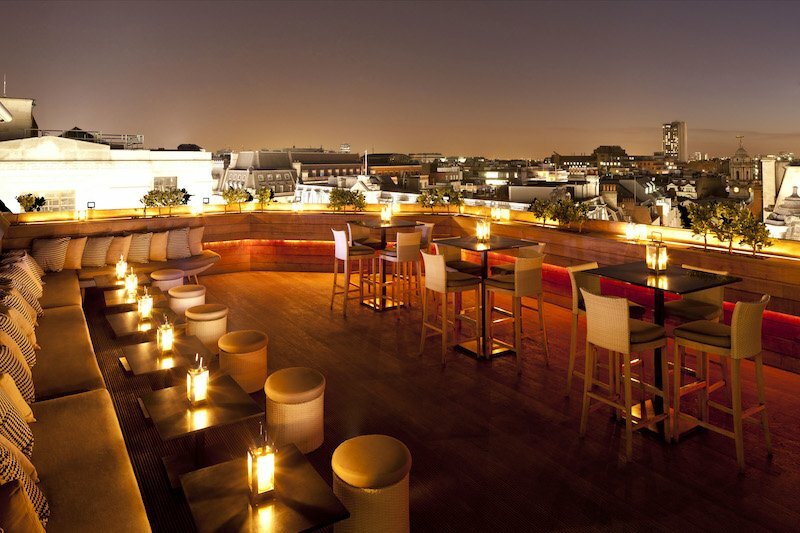 As ever, here at Venueseeker, we’ve scoured the capital for the most romantic rooftop bars London has to offer. We’ve been on the lookout for those venues which really have it all: stunning views, a healthy dose of elegance and sophistication, and the kind of menu that get us swooning in our chairs. After some serious whittling down of a longlist, we’ve come up with a handful of our absolute favourites… and we just know it’s going to be love at first sight. Check out our selections below, and prepare to get someone’s heart fluttering with your flawless taste in classy eateries, and with the delicious dishes and drinks they have to offer! Fancy a touch of real decadence for your Valentine’s dinner this year? Few places in London fit the bill quite as well as Savage Garden, the rooftop terrace of the DoubleTree Hilton which overlooks the Thames. From their stunning tables, you can watch the sunset over the city, and revel in their laid-back vibe and utterly glamorous setting. Straddling the line between the urbane and the vintage, Savage Garden really is a masterpiece of interior design and inimitable London style. 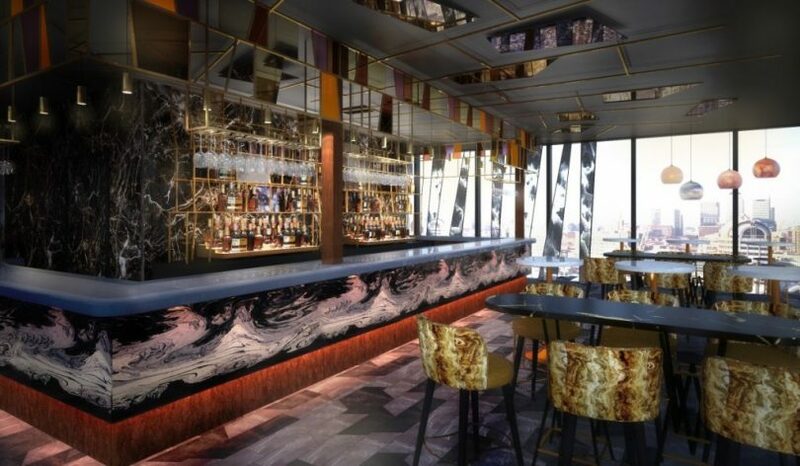 Marble flooring, plush velvet seating, tonnes of natural light and a bar stocked with the world’s finest spirits… what more could you possibly ask for when it comes to a romantic night out in overlooking the river? The dining options at Savage Garden are also perfect for a range of Valentine’s meals, too – from sharing platters to delicate afternoon teas, and from hearty mains to light, fresh, and vibrant salads, there really is something for everybody. Ramp up the romanticism with: Tempura oysters (some say they are an aphrodisiac, after all…) accompanied by the Savage Garden Flambard Colada signature cocktail, made with rum and Ayala Champagne. Delicious! Situated on the ever-fashionable Regent Street, Aqua Nueva takes the chilled out elegance of traditional Spanish dining, and turns the dial up to eleven, London-style. Boasting a team of chefs who clearly take a huge amount of joy in reimagining Iberian classic dishes for the trendy city audience, this is one restaurant where you’re sure to be fed very well indeed any night of the year. However, on Valentine’s day, Aqua Nueva becomes one of the most romantic venues in London. Why? Because the rooftop terrace bar – all cosy seating, candlelight, and incredible city views – is, quite simply, to die for. As if sitting on a candlelit rooftop on Valentine’s day wasn’t romantic enough, the team at Aqua Nueva have created a stunning menu especially for the occasion, which shows off the drama and delicacy of Northern Spanish cuisine. Paired with a quality wines from the same region, the attentive staff and chefs will take you and your partner on a sensory journey which will surely never be forgotten… it really is that good! Ramp up the romanticism with: Well, it’s got to be the Valentine’s Day set menu, which features a platter of the finest jamon, hand-dived scallops and crab, roasted porcini mushrooms, and fillet of Galician beef. One word: WOW. People from London know where the best place to be is at sunset and the chances are that they’ll speak excitedly about the roof terrace of the Trafalgar Hotel. It really is one of the most beautiful places to watch the lights of the city start to glow, and being above one of the most iconic city centres in the world is never anything but a truly luxurious treat. Relaxing on the deck of the rooftop bar promises not only romantic and unbeatable views, it also gives you and your lucky date the chance to sample a wide range of delicious bites to eat, and tastebud-tantalising cocktails to treat yourself with, too. There’s a decidedly southeast Asian leaning to the menu at the Trafalgar, which – if you’re adventurous with your palate and willing to put yourself in the hands of the very capable chefs – is no bad thing at all. There’s a big emphasis on sharing dishes (which is a big romantic box ticked), and nibbles and finger foods, too. In short, if you’re looking for a Valentine’s restaurant in London which won’t leave you feeling too full and bloated to crack out your best moves later in the evening, this might just be the one for you. Ramp up the romanticism with: Soft, pillowy, and packing a delicious punch of flavour, the steamed buns served at the rooftop of the Trafalgar Hotel are a sensual delight all of their own. Pair with a freshly-mixed French 75, made with vintage Taittinger Champagne, and you’re onto a winner. If you’re looking for a slick, stylish, and thoroughly modern Valentine’s day restaurant in London, then Coq d’Argent – in the heart of London’s glittering financial district – is guaranteed to satisfy. With its spacious and relaxed roof terrace, it’s the perfect place to gaze into one another’s eyes, while sipping a quality glass of perfectly served wine, and enjoying some truly impressive dishes on the most romantic night of the year. Coq d’Argent manages to balance the formal and the laid back very well indeed, and specialises in the kind of French bistro-inspired dishes that set you up for a night of romance and new taste sensations. Their Valentine’s day tasting menu (which covers five delicious courses, and comes complete with amuse-bouche and petit fours, is one of the most impressive we’ve seen… so if you’re planning a night which shows off your impeccable foodie credentials, this restaurant might well be the one. Ramp up the romanticism with: Pretty much everything on the Valentine’s Day menu looks utterly ravishing, especially as you get to enjoy it on their roof terrace, surrounding by beautiful architecture and the buzz of the city below. However, the sharing dish of beef wellington with black truffle pomme puree might just take the prize for most tempting romantic dish in the capital! Dial up the romance in New York style at Madison, a slice of the Big Apple in the heart of London’s most elegant and stunning district. This beautiful restaurant boasts a roof terrace with views other restaurants would give an arm and a leg for, and when it comes to Valentine’s Day romance which goes off with a bang, this is one sophisticated eatery that’s genuinely hard to beat. From the rooftop bar of Madisons, the view is dominated by the world-famous dome of St Paul’s Cathedral. Bathed in the golden glow of a London winter’s night, it’s a spectacular backdrop to what will surely be a memorable dining experience. Whether you opt for the restaurant’s signature grills and burgers, or choose something a little more genteel, you and your date will be delighted by this perfectly-situated rooftop restaurant which swings to the rhythms of a New York speakeasy. Ramp up the romanticism with: The Valentine’s menu at The Madison looks like a real treat, but for our money, you can’t beat the lobster roll served at this NYC-inspired joint. Creamy white shellfish and an awe-inspiring dressing is guaranteed to get you feeling the love! Kick off the evening with one of the restaurant’s hot cocktails, such as the ‘Aromatic Genever’, and soak up the atmosphere. Perfection! Ever had a romantic evening in an igloo? No, nor have we. 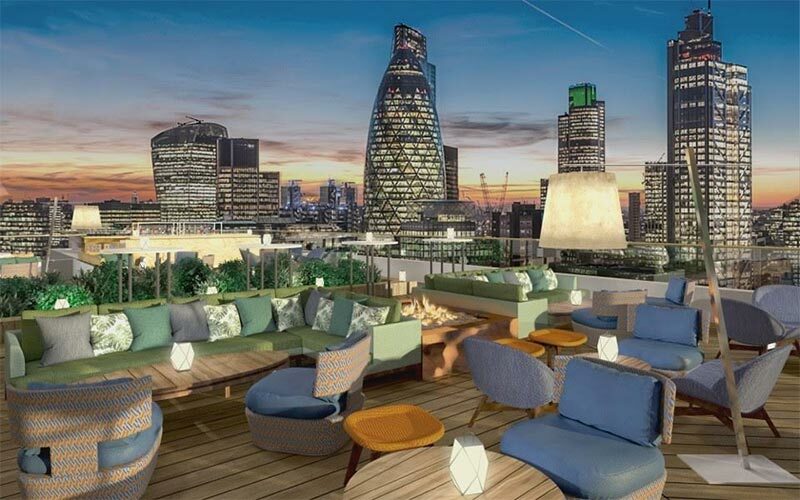 However, the stylish Aviary in Finsbury Square can offer you exactly this, thanks to their beautiful glass pods on their roof terrace, meaning you can enjoy the incredible views of East London whatever the weather. Whoever came up with that idea is, frankly, nothing short of a genius. However, genius is a word which is used more frequently than you might expect when it comes to The Aviary. 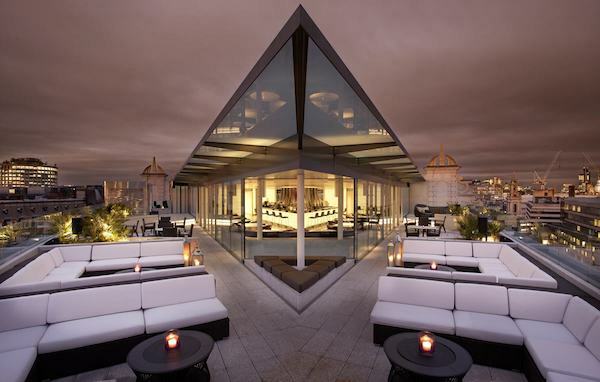 Since opening, it has massively impressed London diners with its jaw-droppingly good cocktail menu and elegant food options, and thanks to the aforementioned roof terrace, it is regularly touted as one of London’s most romantic restaurants. Serving up reimaginings of classic London pub grub, alongside achingly trendy coal oven-cooked meat and fish dishes, The Aviary knows what it’s doing when it comes to big, bold, and unforgettable flavours. It’s hard to think of a better way of spending Valentine’s Day in London than at this beautiful rooftop restaurant, accompanied by dishes designed to utterly delight. Ramp up the romanticism with: The whole sea bream, cooked over glowing coals, is about as close to love at first sight as a dish can get. Followed by the delicious spectacle of a mango pavlova to share, you’ve got a menu that’s sure to get hearts fluttering! Check Out Valentine’s Day Restaurants Near Me Today, and Feel The Love In Style! All of the above restaurants, with their elegant and romantic rooftop bars and terraces, can’t fail to get hearts beating faster and eyes widening with delight. Showing off the very best of London’s contemporary culinary scene, they’re absolutely worth exploring on Valentine’s Day, and absolutely deserve revisiting later in the year. At Venueseeker, we’re constantly finding ourselves impressed by the ingenuity of the restaurateurs in the capital, and it seems that the foodie scene in London simply gets better month by month, and year by year. If you’re looking for the perfect venue for any kind of get-together, party, conference, meeting, or night out, we’d love to help you find something that ticks every box. Get in touch today, and find out why we’re considered the very best in the industry!